Acer has announced that the F900 will be available for purchase in the UK, making it the third addition to the Tempo smartphone series. 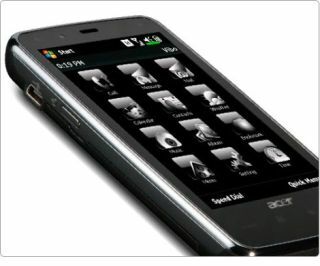 Packing Windows Mobile 6.1 (with a later upgrade to Windows Mobile 6.5 in the offing), it's been skinned to high heaven with the new Acer 2.0 User Interface, which is meant to add 'easy one hand navigation'. This means the desktop on the 3.8-inch massive WVGA (800 x 480) touchscreen can be customised to give direct access to a wide range of applications. As part of the Windows Mobile family, there's new Internet Explorer 6 in the package, although there's always the option of popping in a spot of Opera Mobile or Mini should you prefer that to Microsoft's effort. The 3.2MP camera might not be to everyone's taste, but given that this is rocking the WM 6.1 OS, its main capabilities will lie in the range of work tools, despite Acer's frenzied pointing at the likes of the jukebox and interactive photo albums. We're still waiting on news of an actual release date, but it will be coming at the princely price point of £429. However, we're still waiting to find out about the X960 and the DX900, but still, it's good to see Acer joining the smartphone party in a bigger way.